Does your residential or commercial space have some damaged or diseased trees? 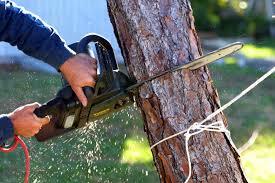 If so, then it advisable you seek our Johannesburg tree felling assistance. Felling trees on your own can be a safety risk, particularly when you lack the equipment and expertise to undertake such a project- that is where we come in handy. We have an extensive experience of felling trees in many areas in Johannesburg. We provide reliable and affordable tree felling services in Johannesburg South, whether it is a public or private space. To ensure the safety of the tree felling project, we utilize advanced equipment to cut the trees down without any damage to other trees or the buildings nearby. Besides our Johannesburg South Tree felling solutions, we may assist with tree pruning to ensure your tree looks well maintained. We offer a broad range of services to satisfy the needs of our clients. We can as well provide stump grinding services and lawn supplies and instant lawn services. As the best tree fellers in Johannesburg South, no other company matches our reliability. We offer prompt, safe and effective and use state-of-the-art tree-felling equipment. Call us today for a free quote on 087 551 0614. We’ll gladly provide our services regardless of whether you have big or small trees.